Credeblug has been strongly involved in the dry cargo business, and underwater handling solutions, since 1965. Many of its products have been working successfully in 52 countries where Blug grabs have become a quality product reference. In the last few years, the company has completed an international expansion, achieving a 70% export rate in 2013 and expecting 80% for the international turnover in 2014. Blug’s product range goes from 50 litres to 150 tonnes capacity. It is one of the few worldwide grab manufacturers offering a quality rope-operated, hydraulic and electro-hydraulic or motor grab catalogue. Blug solutions range from single-rope operated radio controlled and automatic grabs, to 4-rope or electro-hydraulic high volume grabs that fit any crane, material and production requirements. Credeblug has recently finished a very ambitious research project in Pulanfi underwater handling technology which represents another step forward in the grab market; these additional grab capacities will be applied to Blug products and systems that require these kinds of high-tech features. The aim of the project has been to include the latest monitoring and motion capacities by developing its own technological innovations that can improve the performance of handling equipment, and their productivity, positioning and loading cycle flexibility. Dry cargo handling is moving towards cycle automation and Pulanfi technology will be a real step forward for incoming projects’ execution. Below are the most relevant innovations that have been obtained during the project’s research and development process: Electro-hydraulic technology: the electro-hydraulic motion system was identified as the best option to power the grabs as it offers a full control and monitoring of the manipulator, as well as the highest overall efficiency.The hydraulic unit and sensors are assembled the body of the grab, and completely isolated from the environment, preventing the sensitive elements from being exposed to any contact with the environment. Control and vision: Pulanfi technology offers a fast transmission for the information given by the vision systems during material handling and manipulators positioning as the grab offers a more accurate field of vision during different loading/transport/positioning/unloading stages. The grabs include an HD low-light cameras system and LED technology lights combination to offer the best vision possible even in dusty, deep water and/or dark scenarios. Material handling capacity and working environment:thanks to Credeblug’s 49 years’ experience in the design and manufacture of handling equipment, the type of materials and capacity production that could be improved with Pulanfi technology is almost unlimited. The manipulator design adaptation in terms of volume, density, shape and weight of the material can be developed depending on each project’s requirements. In terms of underwater applications, Pulanfi technology is developed to work down to 1,000MSW (metres sea water) depth (though this range of use will be extended in the near future). Material properties research: the different components’ materials have also been adapted taking into consideration the impacts that the grabs suffer during their use, but also to avoid any corrosion caused by the marine environs, especially in aggressive environments. Each mechanical and hydraulic component has been subjected to finite element analysis and computer fluid dynamics simulations respectively to achieve the best performance against impacts, operational stresses and hydrodynamic requirements. The most sensitive parts, like the main structure and hydraulic cylinders, are specially protected with cone-shaped covers and conveniently heat-treated to increase their lifetime. The project technical development finished in June 2013 after real conditions 1:1 scaled material handling validation tests performed on board the Investigation Vessel I in the north coast of Spain. The three-tonne loading capacity prototype successfully completed the tests for material loading, vision and control systems with different arm designs. One of the major aims of the project is to offer an environmentally friendly solution to prevent any type of accidental marine oil spillage, to help on their fast sealing as well as to be used to help in any other kind of natural disaster. The environmental impact of the Pulanfi technology is minimal as the oil and grease used are bio-degradable type and the hydraulic unit includes a variable-flow system that minimizes the electric demand and optimizes overall energy requirements. Product design flexibility: the possible applications of the Pulanfi technology are not limited to dredging or vessel loading/unloading but also to any specific handling or positioning operation to be performed in port and marine environment. During the different phases of the project, the modular conception of the manipulators has been prioritized so their structure could be easily transformed assembling different capacity and shaped tools, this way a wide range of materials could be handled without changing the grab’s main body and motion systems. This modularity represents a big advantage in terms of required investment, but also concerning the simplification of the connection and lifting components. High productivity: due to Credeblug’s long experience in grabs’ design and manufacturing, the efficiency of the manipulator for any material requirements is completely assured. The positioning of the grab could be continuously controlled by the crane operator and lift the cargo once the material is conveniently assured thanks to the high precision vision and data transmission systems. In this way, the highest productivity can be assured for every cycle and avoid material dropping during lifting cycle. Reliability and automation: the specific technology and robust structure combination offers the maximum reliability and significantly reduces the non-programmed maintenance periods. The manipulators’ main systems are continuously being monitored and checked so that complete operability and security can be achieved. Automation for material loading/unloading is also possible using the sensors, vision and security devices included in Blug grabs, so that each project can have a fast return on investment. Following the Credeblug company expansion and product development, the company’s customer portfolio has included during 2013 some of the principal European crane manufacturers, as the perfect crane/grab combination is one of the key aspects to be considered for any shipping contract profitability. Future deliveries for dry cargo handling include two rope-operated scrap handling 12m3 capacity orange peel grabs, three electro- hydraulic 9m3 capacity modular units for biomass handling and an electro-hydraulic mineral handling 20 tonnes capacity clamshell grab’s supply. Salzgitter Maschinenbau AG (SMAG), parent company of the world-renowned PEINER grabs, has restructured itself and spun off the product divisions of the corporation into independent companies. With the transfer of the erstwhile business segment of grabs to the independent PEINER SMAG Lifting Technologies GmbH (PSLT), it will now be possible to concentrate all the processes exclusively on the core product, grabs. “This step is intended to optimize our products and strengthen our customer orientation”, says Juergen Bialek, chairman of the board of Salzgitter Maschinenbau AG and CEO of the new PEINER SMAG Lifting Technologies GmbH. As a result, the company hopes to occupy an even more unchallenged position in the market. PEINER SMAG Lifting Technologies GmbH will take over all the rights and responsibilities with regard to the PEINER grabs and lifting technologies in all the contracts previously signed by Salzgitter Maschinenbau AG. “This will not result in any change in the operative business for our customers; the familiar persons will continue to remain the contact persons in all divisions in the new company” clarified CEO Bialek. 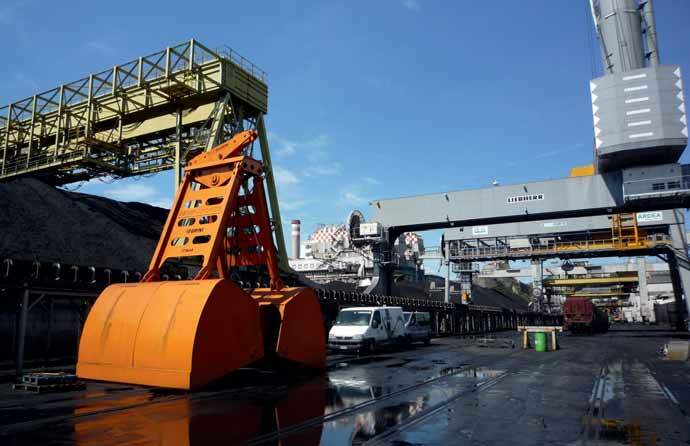 PEINER SMAG Lifting Technologies GmbH is one of the world’s leading manufacturers of grabs for the international loading and unloading markets for bulk goods and other mass goods, particularly marine and harbour cranes. Customers in this segment include shipping companies, stevedoring companies and port crane manufacturers as well as construction machinery manufacturers. The range includes electro-hydraulic grabs, rope grabs, hydraulic grabs, special grabs well as slewing gear, which are used for different applications like the loading and unloading of bulk goods, scrap, trash and wood, as well as for dredging work and special deployments. The SMAG Group is the holding company with factories in Germany, China and India, in which grabs for loading and unloading loading and unloading seagoing cargo vessels, completely equipped driver cabins, automated drilling technology for the open-pit and underground mining industry, special- purpose vehicles for the process industry as well as mechanic and hydraulic telescopic antenna masts are developed and manufactured. The group achieves an annual turnover of approximately €150 million and employs about 900 staff. Rapidpack CorporationTM engineers and manufactures state-of-the-art machines for bulk cargo handling that are operated by shipping companies, ports, dry bulk terminal and trading houses globally. one machine through removal of spill plates, which is designed to adjust the grab capacity to suit cargoes with varying densities. Rapidpack grabs are manufactured in accordance with industrial standards employing sophisticated techniques. These grabs can be mounted on E.O.T. cranes or on hydraulic mobile cranes. Rapidpack manufactures various types of grabs such as wire rope grab, clamshell grab, orange peel grab, remote control grab, electro hydraulic grab and hopper that can be attached to cranes for bulk commodities handling. They are excellent for clinker, wheat, fertilizer, etc. Smooth operations — experienced grab technicians employed by Rapidpack will be present at all times to monitor the equipment from delivery of the grabs through the operation until redelivered at the storage point. The technicians will prepare, rig, grease and service the grabs around the clock as required to secure optimum cargo production. Easy maintenance — all grabs are serviced and maintained to the highest standard. Rapidpack’s skilled workforce performs overhaul and programmed maintenance. As a result, the company can offer fully serviced grabs to its customers for non- stop cargo operations. Skilled operators — in many ports of the world, Rapidpack also offers, in addition to its grabs, highly efficient and qualified crane operators to customers’ loading or discharging requirements, thus the Rapidpack product is truly a one-stop business concept. Italian company CFS International Engineering Handling srl develops, designs and manufactures bulk handling equipment. CFS’s products are used in sectors such as: ports, steel mills, waste, cement, demolition, waste and every type of material handling. The company, a pioneer in the field of design and construction of equipment for handling, is located in Montichiari in the province of Brescia. CFS has a facility of over 2,000m2, with 200m2 for offices and an external area of 500m for the assembly of the hydraulic parts of its grabs, where highly specialized staff and latest technology support every stage of manufacture of the product. Through its experience in different sectors, CFS Handling is able to provide special equipment and customized solutions based on specific customer requirements. The company’s customers use its machines for the loading and unloading of materials. Its grabs are used with the cranes of major manufacturers, including Liebherr, Gottwald and Italgru. CFS’s production includes both mechanical, hydraulic and electro-hydraulic buckets and also hydraulic and electro-hydraulic grabs. CFS recently supplied two electro-hydraulic grabs with capacities of 6.3m3 to the Port of Ravenna for ingots of cast iron handling. These grabs are used on Gottwald and Liebherr machines, with lifting capacities of 100 tonnes. The CFS company is very attentive to product quality and manufactures its own products matching equipment of international importance such as Bosch Rexroth and uses steels such as Hardox 450 and 500 of the SSAB. Today it is standard practice to do things immediately and as quickly as possible in order to lower demurrage costs and to avoid penalties for companies that are doing the work. CFS is active in the port segment of the market, which for example in Italy is affected by the economic downturn in some sectors at the moment, but fortunately not in all. What makes CFS competitive is its quick delivery times, but first and foremost is the product quality. CFS’ purchasing office is supported by knowledgeable engineers, ensuring potential customers a problem-free experience. NEGRINI srl’s depends on its professional, experienced and highly specialized personnel, who give the company a deserved reputation for reliability and expertise. NEGRINI’s technical team is always at the ready to deal with and solve any type of technical problem. It understands, and offers solutions to, its customers’ problems. For more complex issues, the company turns to its qualified engineers to develop the appropriate solution. Today, the company has 14 employees and, when necessary, it also works with external collaborators. NEGRINI srl has three warehouses, of around 750m2, equipped with two 6.3-tonne-capacity overhead cranes. With every customer application, all elements of a project are studied and planned, right down to the design sketches. Everything is carried out in accordance with the person responsible for the relevant department, in order to guarantee delivery times, reliability and the optimum use of resources. All technical data, and sketches, are then input into a three- dimensional software system. NEGRINI srl’s welders are all qualified according to the EN 287-1 standard. They are regularly checked and active in theirrecognizedactivity. Trainingisfacilitatedbycertified external technicians. All products are subject to strict quality control procedures, from the beginning of a project right through to the production process. Before products are dispatched, the final unit is submitted to stringent controls and tests, with the aim of guaranteeing their effectiveness in trials and assuring a high-quality product for the client. Hydraulic orange-peel grabs are the optimum solution for handling rock, scrap, and recyclable materials, applicable on all hoisting devices or crawler cranes. Clamshell grabs are the optimum solution for any bulk material, that can be used on all hoisting devices — two- or four-rope or crawler cranes. Hydraulic clamshell grabs are the optimum solution for any bulk material, that can be used on all hoisting devices or crawler cranes. Clamshell grabs are the optimum solution for any bulk material, that can be used on all hoisting devices or crawler cranes. NEGRINI’s radio controlled single cable clamshell buckets are the ideal choice for handling all loose materials. They do not require any external power supply, are universal and applicable on all cranes. The radio control manages the opening of the clamshell. Environmental clams are used for handling mud, polluting sludge, etc. They are ideal for underwater excavations in difficult areas such as quarry, river, sea, etc. They are constructed with Hardox steel to ensure strength, long life and moderate weight. Large hydraulic pistons are used to operate the grabs. In environmental dredging, it is essential to remove the polluting sediment evenly. Clamshell buckets are an ideal solution for digging foundations and consolidation work, applicable on all tracked cable cranes. Dragline buckets are an ideal solution for dredging quarries and rives, applicable on all tracked cable cranes.